O Blessed Virgin Mary, Immaculate Mother of God, who didst endure a martyrdom of love and grief, beholding the sufferings and sorrows of Jesus! Thou didst co-operate in the benefit of my redemption by thy innumerable afflictions and by offering to the Eternal Father His only-begotten Son as a holocaust and victim of propitiation for my sins. I thank thee for the unspeakable love which led thee to deprive thyself of the Fruit of thy womb, Jesus, true God and true Man, to save me, a sinner. Oh! make use of the unfailing intercession of thy sorrows with the Father and the Son. that I may steadfastly amend my life and never again crucify my loving Redeemer by new sins; arid that, persevering till death in His grace, I may obtain eternal life through the merits of His Cross and Passion. Amen. Grant, we beseech Thee, O Lord Jesus Christ, that the Most Blessed Virgin Mary, Thy Mother, whose most holy soul was transfixed with the sword of sorrow in the hour of Thy Own Passion, may intercede for us before the throne of Mercy, now and at the hour of our death. Amen. Imprint, O Lady, thy wounds upon my heart, that I may read therein sorrow and love; sorrow, to endure every sorrow for thee; love, to despise every love for thee. Amen. 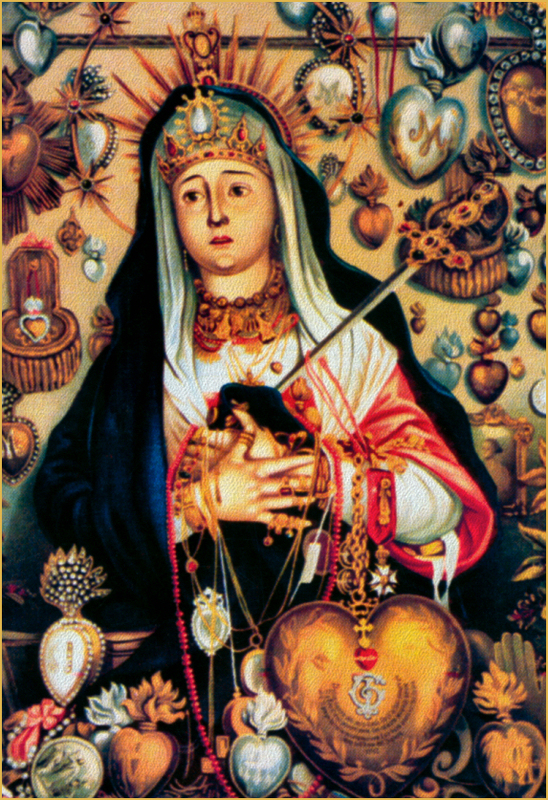 Mary, most holy Virgin and Queen of Martyrs, accept the sincere homage of my filial affection. Into thy Heart, pierced by so many swords, do thou welcome my poor soul. Receive it as the companion of thy sorrows at the foot of the Cross, on which Jesus died for the redemption of the world. With thee, O sorrowful Virgin, I will gladly suffer all the trials, contradictions, and infirmities which it shall please Our Lord to send me. I offer them all to thee in memory of thy sorrows, so that: every thought of my mind and every beat of my heart may be an act of compassion and of love for thee. And do thou, sweet Mother, have pity on me, reconcile me to thy Divine Son, Jesus; keep me in His grace and assist me in my last agony, so that I may be able to meet thee in Heaven and sing thy glories. 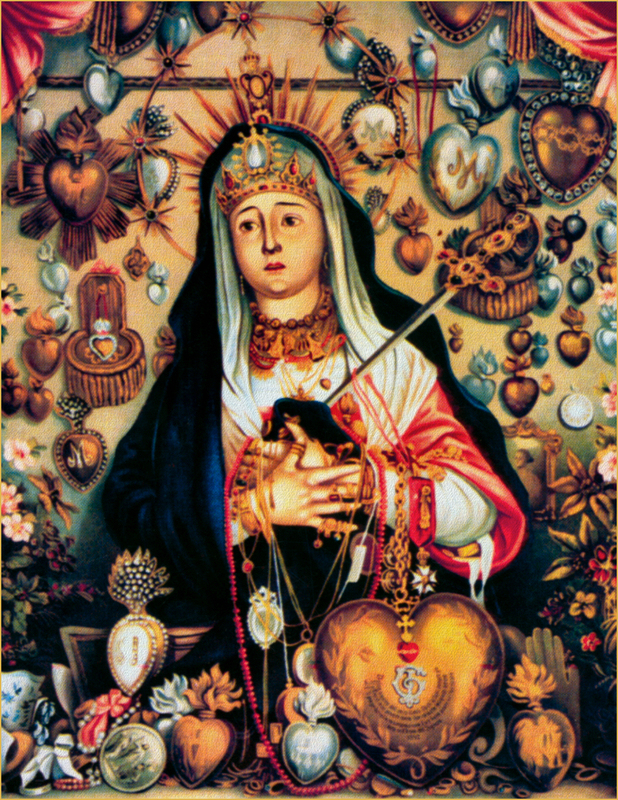 Most holy Virgin and Mother, whose soul was pierced by a sword of sorrow in the Passion of thy Divine Son, and who in His glorious Resurrection wast filled with never ending joy at His triumph, obtain for us who call upon thee, so to be partakers in the adversities of Holy Church and the Sorrows of the Sovereign Pontiff, as to be found worthy to rejoice with them in the consolations for which we pray, in the charity and peace of the same Christ our Lord. Amen. O Mother of Mercy, Help of Christians, most faithful minister of Divine Providence, treasurer of all graces, remember that never in the world has it been heard that thou hast left him without comfort who has come to thee with true devotion. Wherefore, I, trusting in thy tender pity and in thy most generous providence, bend low before thee, praying that thou wouldst hear my prayer. Obtain for me a holy provision for the future, namely, graces for all my spiritual and temporal needs. I fervently recommend to thy loving motherly Heart our Holy Church, the Sovereign Pontiff, the conversion of sinners, the spread of the Catholic faith and those Souls chosen by Our Lord, who are suffering the tormenting flames of Purgatory, that they may soon be comforted with eternal refreshment. Amen. In order to appease Thy Divine Justice, we offer Thee, O Lord, the merits acquired by Mary, Thy Mother and ours, when she stood at the foot of the Cross. If Thou, O Lord, wilt mark iniquities, Lord, who shall abide it? Many favors have been obtained by reciting the above Offering.